Publicação seguinte // Play the Free Trial! We’re excited to launch the Battleborn Free Trial, and even more excited about what this means for the dedicated Battleborn community. With this Free Trial, we hope to bring lots of new players into Battleborn to experience the incredible, chaotic battle for the very last star in the universe. It has been a joy and a privilege to interact with the Battleborn community over the past year, and we want to show you how much you mean to us. We consider you our Founders and we’ve created something special just for you. Everyone who purchased and played the retail version of Battleborn prior to the release of the Free Trial on June 6th, 2017 has been credited the Founder’s Bonus. 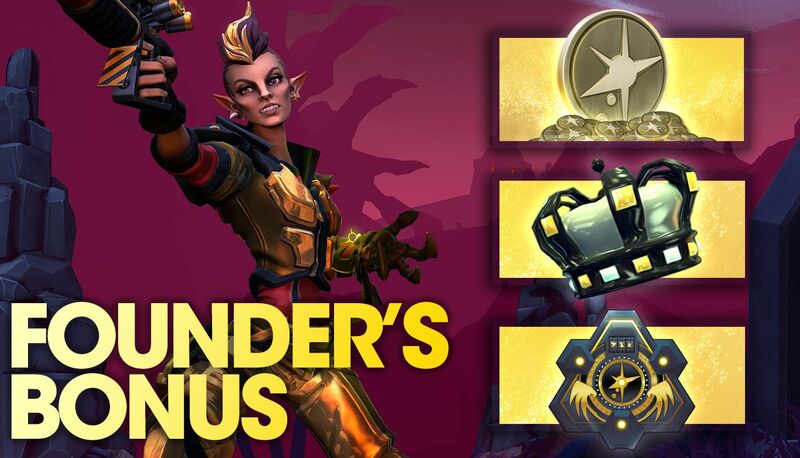 When you log into Battleborn, the Founder’s Bonus will already be granted to your account. Head to your Command center to open the new loot packs, equip your title, and spend that sweet Platinum. Everyone who purchased and played the retail version of Battleborn prior to June 6th, 2017 has been granted the Founder’s Bonus. To confirm you received the Founder’s Bonus, head to the Command center. On the top left-hand of your screen, you should see an additional 1,000 Platinum and 50,000 Credits by your account name. The “Founder” title can be found and equipped from the Career tab. Mellka and Deande’s gold skins can be viewed in their respective character pages, and equipped during the character select phase of a match or mission. Head over to this FAQ for in-depth look at what the Free Trial entails. Follow Battleborn on Twitter, Facebook, YouTube, the blog, and Instagram for all the latest news and hang out with the community on Reddit, Twitch, and the Gearbox forums.